We pride ourselves not only for the unique beauty of our vacation homes but also for the quality of our services as well as our staff. When reserving your stay at Tenuta dell’Alto you will have the guarantee of a great concierge service to help you plan your stay ahead of time, and the best attention to your needs while vacationing at the house. Our cook will be available for any meal of the day and she will delight you with the best of Pugliese and Mediterranean cuisine with fresh and genuine ingredients. Our manager and gardeners will assist you with any of your needs while staying at Tenuta dell’Alto. Our drivers, massage therapists, yoga instructors, tourist guides, and the vineyards & wine producers we selected for wine tours and tastings are all very professional and the best in their field. We can help you make your vacation in the Salento a quiet self catered one away from it all, or one fully catered to your wishes and level of activities! With all of our homes in Italy and Mexico we strive to provide a special experience for our guests and we believe that our caring for you and your travel companions should be a natural reflection of the care we put into the design and quality of all our properties. Let us know how we can spoil you and find below a small selection of what we can do for you! On the evening of your arrival, or on any other night of your stay, our cook can be reserved for a scrumptious 5 course meal with wine made exclusively with fresh, local ingredients mostly from our organic vegetable garden and in the most authentic Pugliese Mediterrean style. The meals are fully served and customized for your group. You can also indulge in a wonderful breakfast delivered to the kitchen or the portico, complete with fresh baked goods, juice, coffee, cereal, yoghurt and more. Prices upon request. Can be arranged upon your arrival so you have a full stocked refrigerator and pantry. We will provide you with a list that you can edit to suit your needs and we add a small fee for handling it and getting it delivered to you. Special requests welcome! We are lucky to have wonderful chefs in the area with whom we organize cooking classes for our guests in the comfort of Tenuta dell’Alto as well as in selected restaurants and culinary centers. 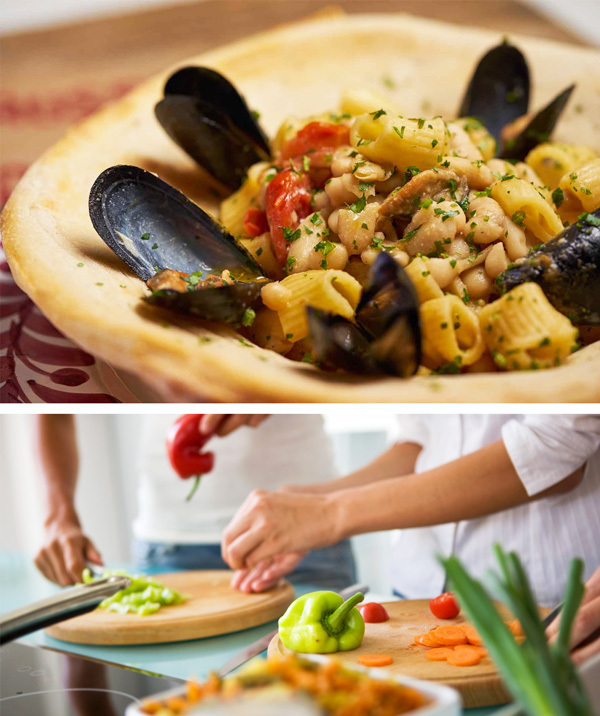 The home chef is an especially wonderful experience if you want to explore the secrets of superb Italian Pugliese food . Dinner with wine is served after class and wine pairings can be requested. Ask us about the available custom menus! The local cuisine has a very rich history and the focus for every chef is to use seasonal ingredients, local flavors and recipes to make this a fun convivial experience! This area of Puglia is particularly know for its wonderful wines, especially red and rose’ with grapes such as Primitivo, Negroamaro, Susumaniello, and more. The views from Tenuta dell’Alto are a patchwork of fields, olive orchards and the vineyards that produce some of the best of them! At the house you will find an underground cellar with selected local wines and a price list for your use. Feel free to drink all you want and we will charge accordingly for their use after your departure from the house. If you have any specific wine requests let us know and we will try to accommodate you. If you want to know more about these and more delightful wines in the area and learn about their characteristics we will organize a wine tasting and invite an expert chef in the comfort of the house! We can also arrange wine tours to visit some of the most wonderful and renown vineyards, with and without a driver, such as Paolo Leo, Cantele, Tenuta Rubino, Leone De Castris, Tormaresca and more, Usually the tours are organized so you can visit 2 or 3 vineyards for tastings in each one, with a light lunch or picnic at one of the vineyards or good local restaurant. 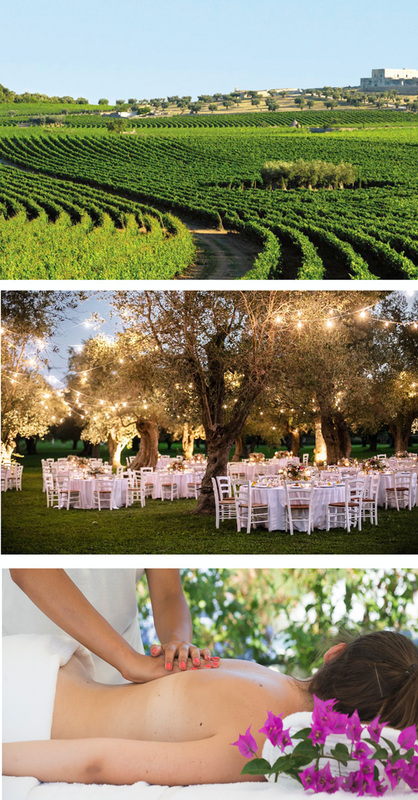 Tenuta dell’Alto is a place to celebrate life in all its beauty and with the most dear people you have. Our guests come often to celebrate birthdays, special events, weddings and each time we love to help them organize events in all their details, so that you get to enjoy every minute of the special day, before, during and after! We make the best of each event and customize each one, no matter if it’s a special dinner or a large wedding, to your needs and style. We have a great network of professional people, from caterers to musicians, from photographers to hair dressers, who can make any celebration a memorable one. If your wishes are simple we include that into the rental of the hosue through our concierge service and if you need major planning we will work with you on a small fee for our help. The estate has 2 chapels on it of which one is still consacrated so we can hold religious weddings as well. Ask us for more details! Different size cars and Minivans are available and can be scheduled in advance if you need to be picked up or dropped off at a train station, airport, or if you would simply like a chaffeur to take you to the places you want to visit without driving yourself. We can organize private tours to any destination for a single day or for the entire week. Our drivers will also allow you to explore out of the way castles, villages, wineries and vineyards and we can combine all this with wine tastings and special meals in the most beautiful areas of Puglia. Let us know your needs and we will be happy to schedule any car transfer for you. Professionally trained and very experienced massage therapists will come to the house for your convenience and deliver a great selection of treatments and massages including Lympho-draining massages, Holistic massages, Chinese zu reflexology and much more. Prices vary. Ask us for availability. Alternatively we can recommend nearby beauty and wellnes centers that can provide a wonderful variety of services.